Hi..Today, Tuesday, is a beautiful "sunny" day here, so thankful for the sun to shine on us. I have attached photos of cleanup in the works. For all who have emailed, again, thanks. 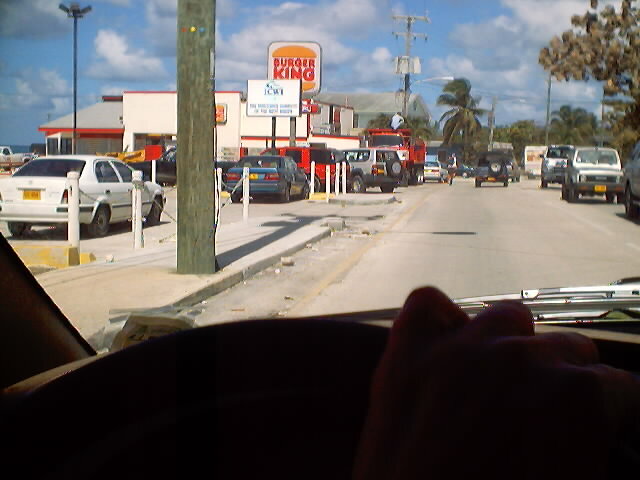 These photos are of Westin Casurina Resort, Burger King, and view down both directions of Seven Mile Beach. we would appreciate if you could post the attached message on your website. 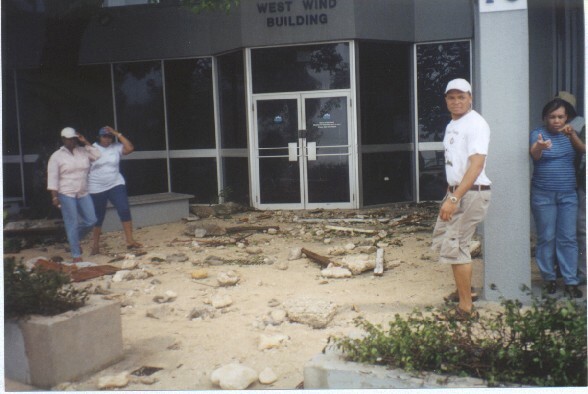 Hurricane Michelle passes the Cayman Islands. Grand Cayman, B.W.I. 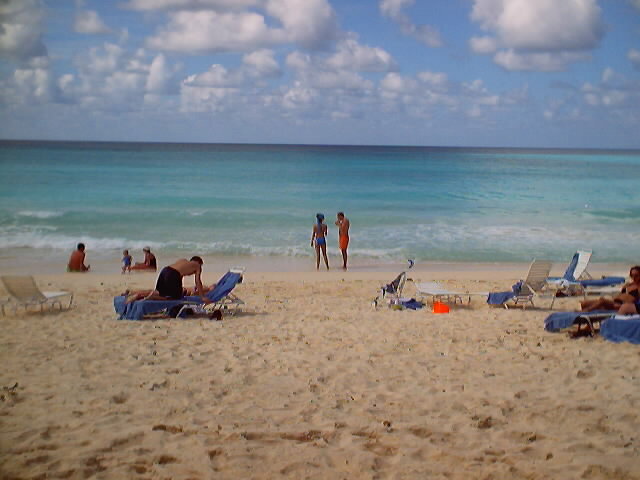 - November 6, 2001 --After a stormy weekend, the Cayman Islands awoke to beautiful blue skies, balmy breezes, and a temperature of 80 degrees. 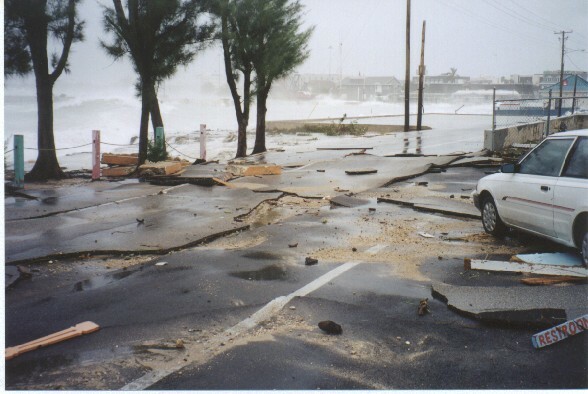 The Cayman Islands National Hurricane Committee has issued the "All Clear" for the Cayman Islands following the passage of the Hurricane Michelle effective 11:00am, November 5, 2001. Throughout the last few days the three-island destination monitored and tracked Hurricane Michelle in anticipation and preparation for what the weather system might deliver. 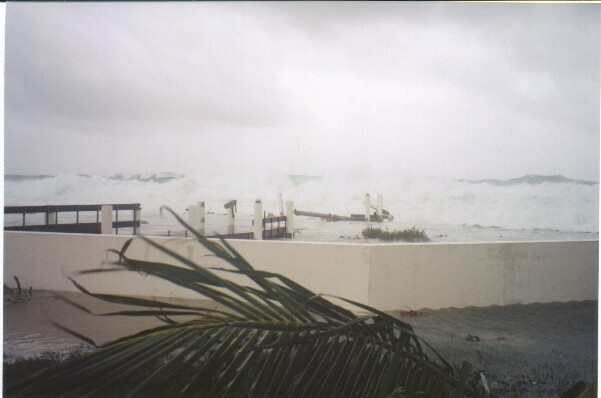 With high seas, rain and winds, the residents and businesses prepared for Michelle even though it was only predicted to pass by to the west of Grand Cayman. Early on Sunday morning, the weather system passed some 140 miles to the west of Grand Cayman. 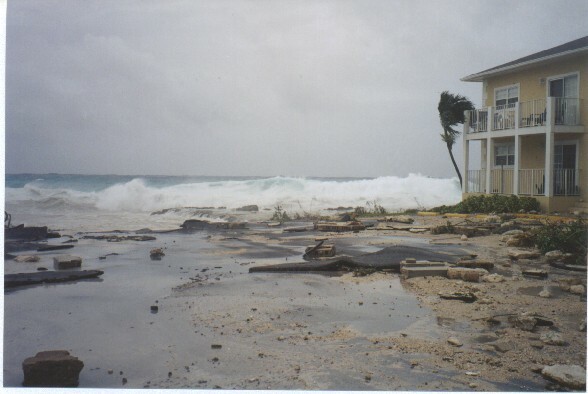 The hurricane did not approach the Cayman Islands directly and the conditions were not severe enough to delay or cause the cancellation of any scheduled air service to the country during the time that it passed the Cayman Islands. All international flights to and from Grand Cayman's Owen Robert's International Airport operated as scheduled during the weekend. The Cayman Islands Department of Tourism and its private sector partners have begun the process of evaluating and assessing the damage caused by the storm surge and wave action as this Hurricane passed through the northwest Caribbean. 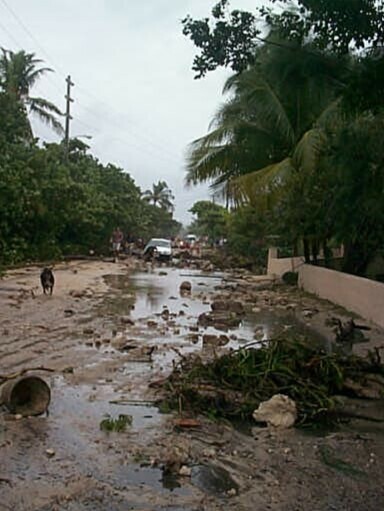 Marine conditions throughout the weekend caused coastal damage on the northwest coasts of Grand Cayman and throughout the harbor in the capital of George Town. 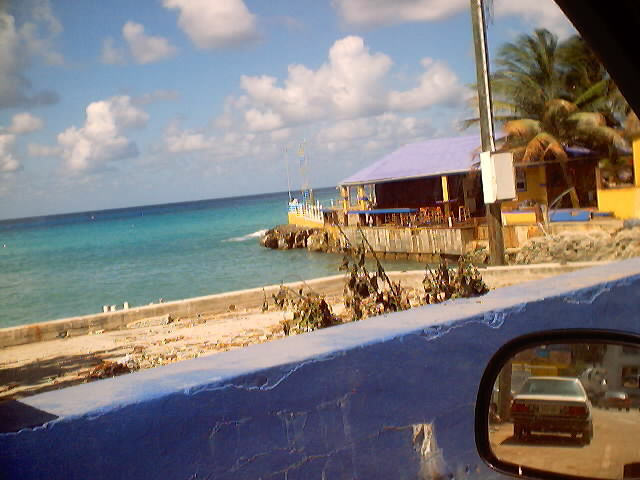 Some properties and buildings along the Seven Mile Beach area and in the vicinity of Northwest Point, West Bay sustained waterfront damage. The Cayman Turtle Farm, located in Northwest Point has suffered significant damage and is closed to the public at this time to facilitate the clean up and recovery efforts. Throughout Sunday, November 4, 2001, island residents and volunteers relocated many of the farm's turtles to a safer habitat. In addition a number of properties along North Church Street, Harbour Drive and South Church Street experienced varying levels of damage. 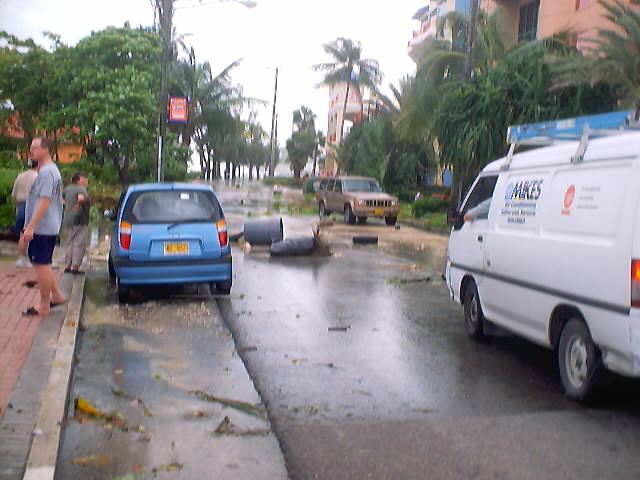 As a result, some of these streets are impassable in a number of areas due to debris and the clean-up effort. All other attractions including the Botanic Park and Pedro St. James were not affected and continue to be open for business as usual. Most hotels, restaurants, watersport operations, condos, airlines and car rental agencies are open and are serving the visitors on Islands, as well as encouraging visitors to the Islands. The Department of Tourism is asking persons with travel plans to the Cayman Islands to contact their intended property for up-to-date information on specific conditions or by calling the Cayman Islands Tourism Association at 345-949-8522 or the Sister Islands Tourism Association at 345-948-2266. Persons who wish further information in regards to the conditions within the Cayman Islands should visit www.caymanislands.ky. Located 480 miles south of Miami in the quiet western Caribbean, this trio of tiny islands is a premier destination for discriminating travelers, honeymooners and families. World renowned for its beaches and diving sites, and ranked as the world's fifth largest financial center, the Cayman Islands offer exciting recreational opportunities along with friendly, high quality, modern service. To learn more about the Cayman Islands, visit www.caymanislands.ky or call your local travel agent or the Cayman Islands Department of Tourism at 1-800-346-3313.
throughout. Progress is astounding in some areas. Roads that were seemingly impassable only 24 hours ago are now open. Kudos to the crews for their hard work and amazing progress. hardest hit areas awaiting collection or removal. As work continues, I will try and post more reports and pictures. What a difference a mostly sunny day makes. Here are answers to more questions I received by e-mail today. Rather than reply to the senders directly, I'm posting them here to share with other concerned friends of Cayman overseas. Atlantis Submarines had some damage to their shoreside facility, but the submarines and boats are fine. In fact, they expect to be up and operating for tours later this week, when sea conditions permit. Cobalt Coast the Divetech dive shop on the property were OK and cleaning up storm surge debris, but were NOT destroyed ---there was damage to the dock. 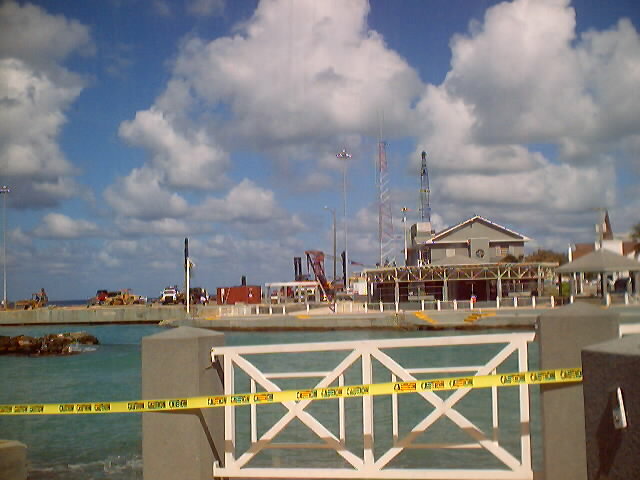 Unfortunately, the Divetech/Turtle Reef Divers shop beneath the Cracked Conch was demolished. Ocean Frontiers and Tortuga Divers at East End were out diving today---no damage and resorts at East End were untouched. 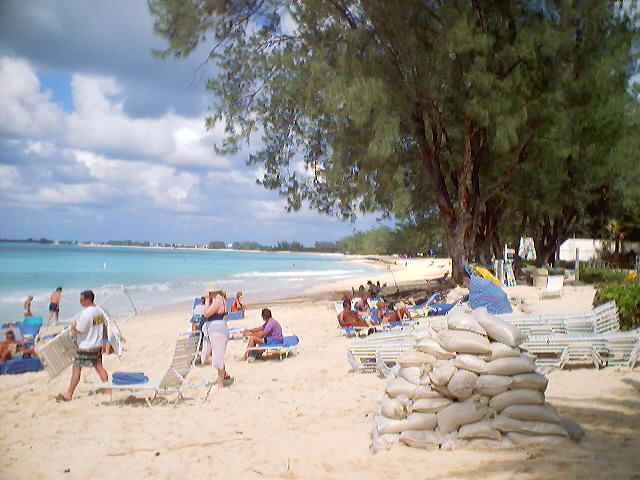 All of the resorts along Seven Mile Beach are open for business. 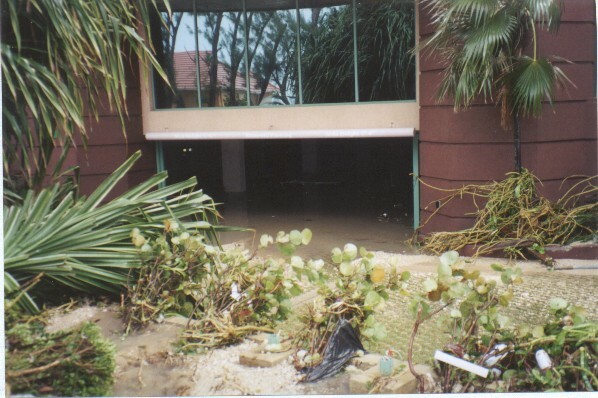 Damage to ground floor oceanfront rooms occurred at Seven Mile Beach Resort, Treasure Island condos, Grandview, Beach Club and several others...but none have had to close. Grand Old House was NOT destroyed! They did suffer some damage but Martin reported they were having a scheduled wedding there tonight. How's that for resilient spirit! 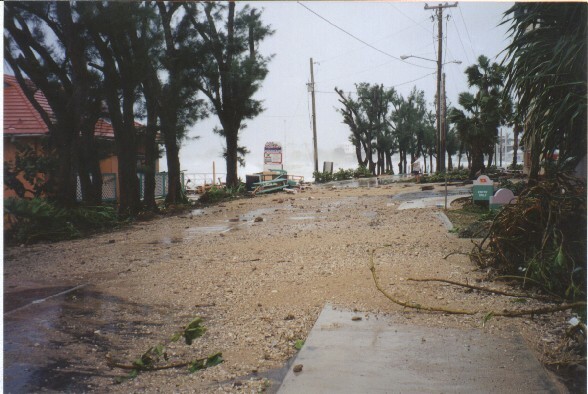 All south coast resorts in Little Cayman were open and undamaged. Pirates Point guests were out diving this morning. Michelle seems to have rearranged not only the west coast of Grand Cayman, but the interior of the Glass House--i.e. our government, in a startling announcement late today. See http://www.caypolitics.com for details on the proposed new Executive Council ministers. from the rains of the last ten days. Burger King has had its car park rearranged courtesy of the wave action. however the tank filling station and some storage areas appeared damaged. the dock is gone and thus utilization of the ramp will be a lot harder. sand deposits whilst others say that erosion has been terrible. the concern, support and well-wishes. First, to everyone who has sent an email concerned for all of us here in Grand Cayman, we are all well, yes we got alot of damage, however, we sustained no loss of life. All areas of the island in my drive about this a.m. are in high gear as far as clean up goes and we do have our utilities working and intact. There are areas such as South Sound, GeorgeTown, and West Bay not leaving out 7Mile too that are working briskly to get things back to normalcy as quickly as possible. We should be up and running well before the end of the week and those areas i.e. south sound and west bay will take alittle longer because of structural damage but they too are working very hard to regain their homes and apartments. 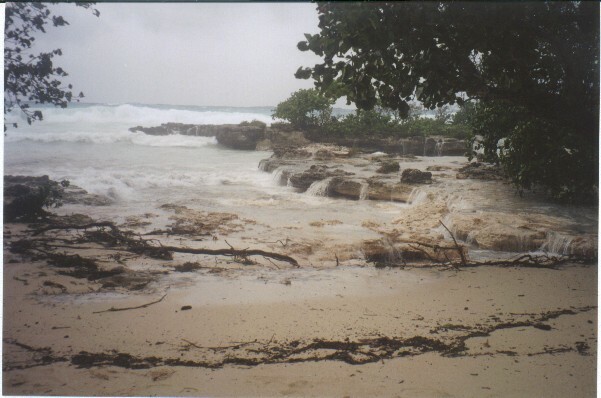 I walked the beach on 7mile as far as Lacovia and yes they have some water damage some of them minimal and Lacovia in particular is up and running with tourists at the poolside, the maitenance people are busy raking the beach so we are all strong, we will regain our beauty and be ready for high season! It is important to remember that yes all these storms should be taken seriously, none of them should be overlooked in any way, they can do very very serious damage in a short span of time. But we have been blessed not to have any loss of life, our shores will be just a beautiful as all of you remember them very very shortly. I will post some AFTER pictures soon. confirm there is extensive damage from South Sound to Northwest Point. waves coming into aparments at the neighbouring complex. wave may have pulled him back to sea, with luck. units leaving water over a foot deep in some. around the property had obviously originated inside some of the units. road and all that remains is rocky outcrops. is most of the patio. Again, water damage extended into the building. were flooded. Water over 3 foot deep sat in and around the fuel containers. back the force of the waves which smashed through the main door entrance. making cyclers and walkers the only moveable traffic. pickup truck was lifted out of the parking lot and onto the wall by the bar. north as the old bakery - over half a mile away! precaution, barracades remain in many areas. the order of my text above. 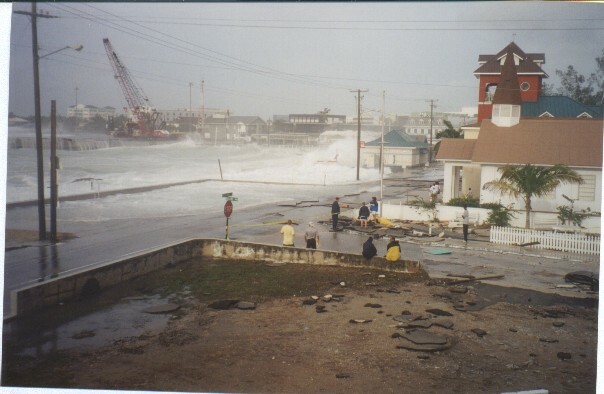 remember damage of this level, with the exception of the 1932 hurricane. Thank God for a sunny morning, the first in over a week. Our back yard is already drying out and the herons and other water fowl are moving on and the Anis and quits are back feeding on flotsam. 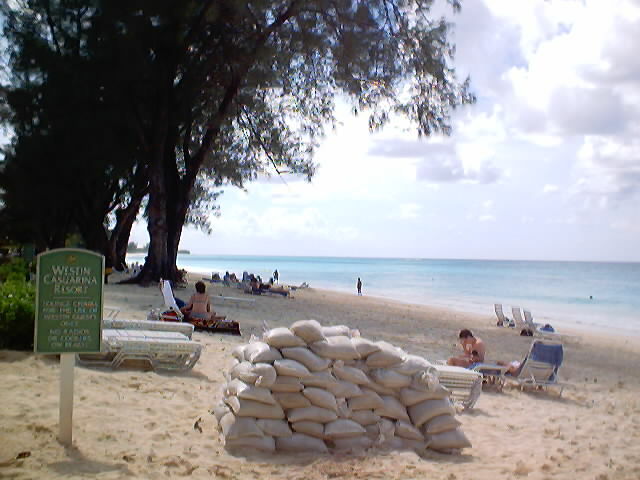 I just wanted to send a brief reassuring message for the many friends of Cayman reading this site overseas. Somehow video footage of George Town and the "awesome" wave action over the weekend was picked up by network TV in Miami, showing Cayman out of overall context--i.e. mass destruction. This is NOT the case! Mayhbe this was file footage--I don't know. But please, let's not make matters worse by sending out video right now! As Lisa posted earlier, we were very lucky (no, make that blessed!) that this storm passed us by 130 miles NW. I want to reassure everyone out there that in spite of the damage along the coast, on Grand Cayman our airport, phones, utilities, water and other amenities on Grand Cayman are intact. Government is already tackling road repair and cleanup in George Town as of 6 am this morning. This is not meant to downplay the hardships the we and other of friends with businesses are facing now. But there was no loss of life or more serious aftermath. At times like this, it's important that we keep things in context visually for the rest of the world. So I also urge that anyone posting digital photos anywhere include some kind of explanation or brief captions and post "after" shots later this week if possible. We don't want to scare away what few visitors might have come for the Christmas holidays! News media are famous for making storm aftermaths worse. I remember vividly what CNN did in 1988 when a rogue crew came down, filmed the burned down Royal Palms hotel site (that happened in May, not September!) and the still-unfinished Treasure Island hotel site and reported is as storm damage---and people thought Cayman was devastated. Good luck to all down here this week. While our island was hit very hard by Michelle, today, Monday you would never know looking out to the sea from Ocean Club. Everything is calm, the sun is finally coming out the sky is beautifully blue and the winds have calmed to just a very slight breeze which is normal for us. 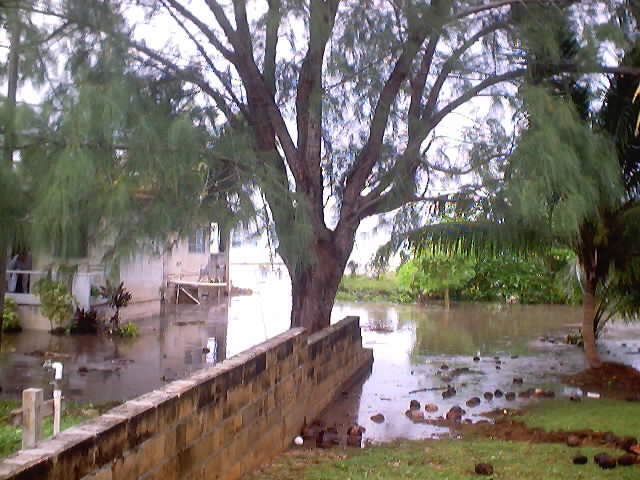 We do have utilities all working on this side of the island, i will have to report later, the curfew (sp?) that the government had set for certain areas which received most of the damages has now this morning been lifted. Schools are closed both government and private due to the extensive damage to roads and some of the areas where water has been cut of like south sound and beach properties. have not been to the beach this a.m. as there are some reports they are still experiencing high waves. things are going to be closed today due to damage relief efforts........thankfully God spared any lives lost properties can always be prepared and people here will get things back to normallcy quickly i am sure. Be sure to scroll down and check out the pictures of the storm i posted.........they show some of the damages to South Sound, GeorgeTown, 7 Mile, and West Bay. Thanks to all of you who have sent emails sending your prayers and thoughts..............We will be up and running on this island quickly and back to business and usual here on our Beautiful Island! Today, we had wind and high tides, but we were spared in this storm. and the sea not from houses. 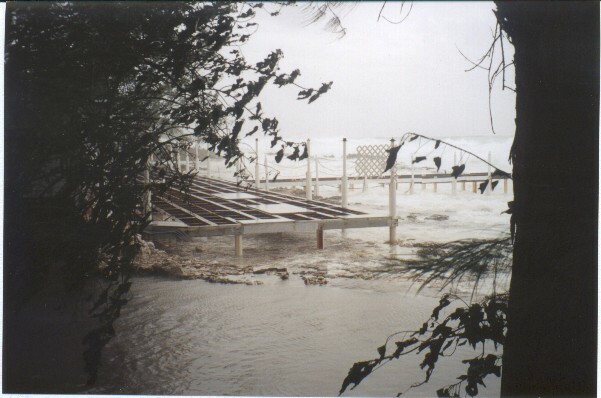 amount of pier damage at Rum Point). its beach again. It is sad. and it seems we will be FINALLY coming out from under this cloud of rain! and will have all repaired quickly! You folks north of us - good luck and hope you keep safe. 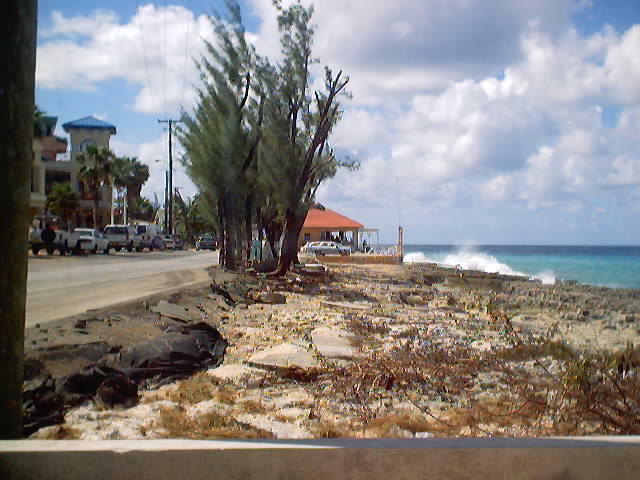 At the old Fort site, opposite Cayman National Bank, the road itself has been ripped up and all sorts of flotsam and jetsam is littering the road, including large amounts of wood and rocks. 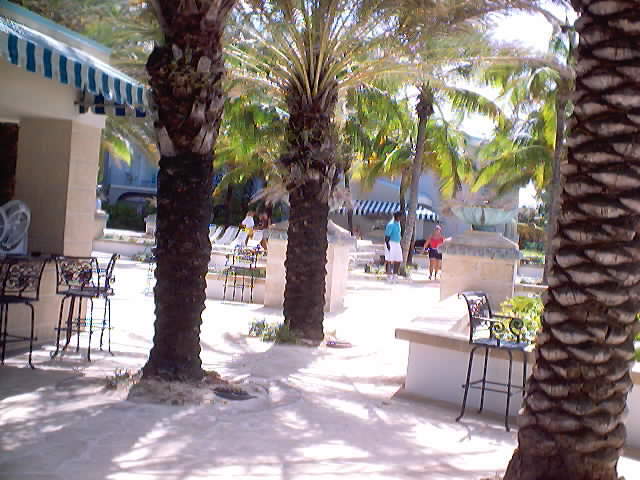 I then drove up to SMB and walked from Beach Club Resort up to the new Holiday Inn. 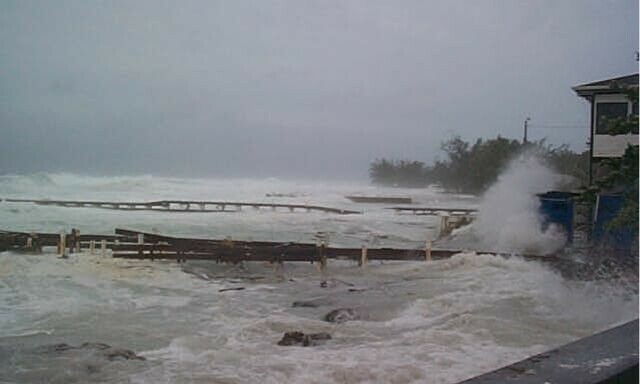 The waves are very big and powerful and significant amounts of beach erosion has occurred and a few coconut trees have been dislodged, although the properties along SMB seem to have survived fairly well. The Ritz Carlton building site is now a lagoon. 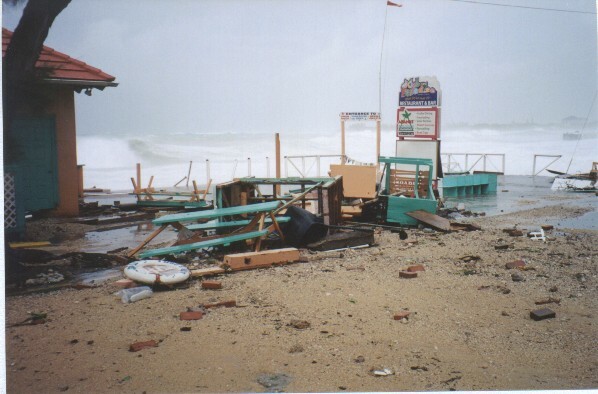 At Public Beach, one of the cabanas has been destroyed and several more badly damaged. 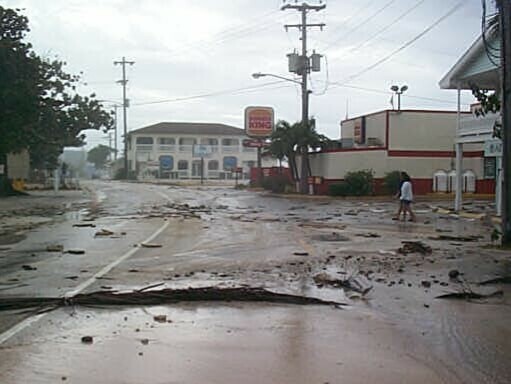 Sand and debris still cover the road, but its is passable. I have heard that North West Point Road is closed and significant damage had been done to both the Turtle Farm and the Cracked Conch restaurant and Dive Tech outlet. A friend told me that a divemaster was swept out to sea whilst trying to take photos and was rescued, as he clung on to a buoy, by an off-duty policeman with a jetski. Some MAD people have been swimming in the sea along SMB and there have been lots of reports of 'children' having to go to the hospital, with cuts and bruises caused by wave action. 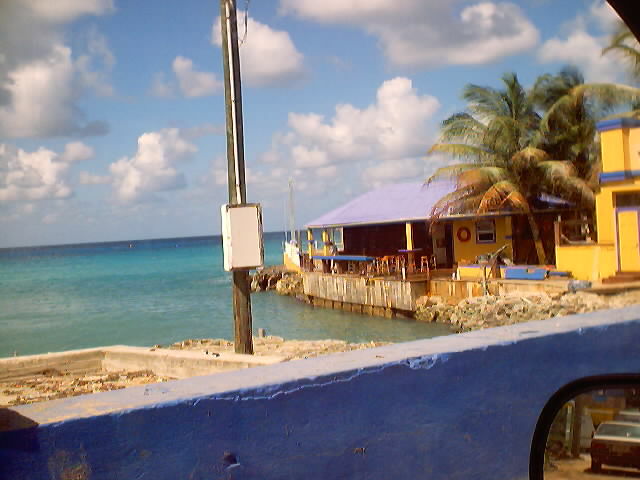 South of George Town, I have heard from a policeman that Sea View, Sunset and Blue Parrot bars have all been partially, if not fully, destroyed. Texaco has an oil leak also, but access to that area is restricted to residents only (if any still remain in their homes). Smith's Cove has completely changed its appearance due to erosion by enormous waves, which are regularly hitting the car park. I received the following report from a friend who lives at the Windsor Village apartment complex, south of Smith's Cove: "A storm surge has just burst into our apartment. The front properties at Windsor Village are devastated and dock and cabana gone never mind TV and furniture in pool and water everywhere. I guess others will be even worse. Heard of 3 foot flooding in Mercury Crescent and a gas leak at Texaco dock. Hoping the worst is over and only the clean up remains." twice. Thanks for the kind emails received. highest the sea has been since the 1944 Hurricane. come any closed, never mind given us a direct hit. it gives me no comfort to say "I told you so". are now facing a direct hit from Michelle. Here are some damage shots as unfortunate as it is, we did get some pretty bad damage, these are from town and other areas. I had to add to Donna's grim news...but here goes. 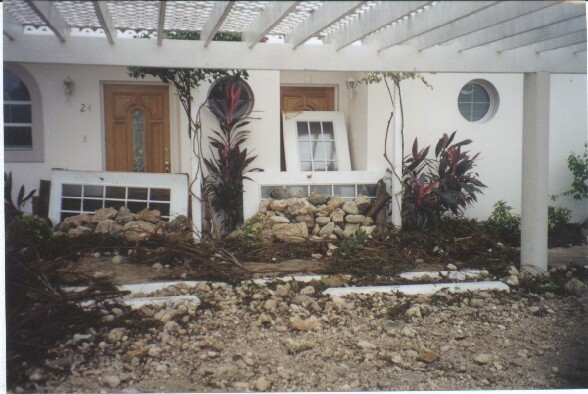 My stepson Timothy and his wife live near Coconut Harbor off South Church Street on Grand Cayman and went out and reported major damage from Sand Cay on the southwest tip north to Sunset House. 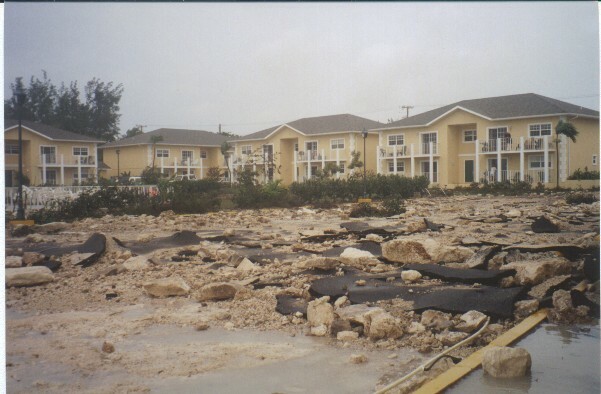 The luxury oceanfront Windsor Park condos took a major hit, with furniture and appliances washed into the road. 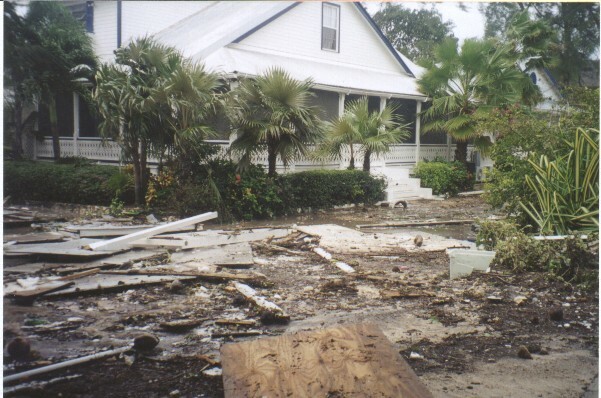 Grand Old House deck and gazebo are gone, Sunset House bar destroyed. They also confirmed what Donna said about downtown George Town. Eden Rock and Paradise Bar and Grille have suffered major damage.On foot, they were able to get a little further into town as said they saw huge waves actually washing over the top of the Port Authority building early this afternoon. The asphalt surface of Harbour Drive near the Westwind Building has been torn up and is impassable. Debris, including scuba tanks from, apparently, Eden Rock dive Center or Paradise Bar are as far north as the Tower building parking lot and there is a lot of other debris. The construction site on the beach at the Ritz Carlton site "looks like a giant swimming pool, filled with sea water." No word about the condos or hotels along the beach. Again, this is second hand reporting, but I consider it reliable, unfortunately. First hand, I can tell you that Owen Roberts airport never closed, there is only minor flooding on the airport road, and flights seem to be running close to schedule, although I have not seen American in here yet. Could be just my timing. 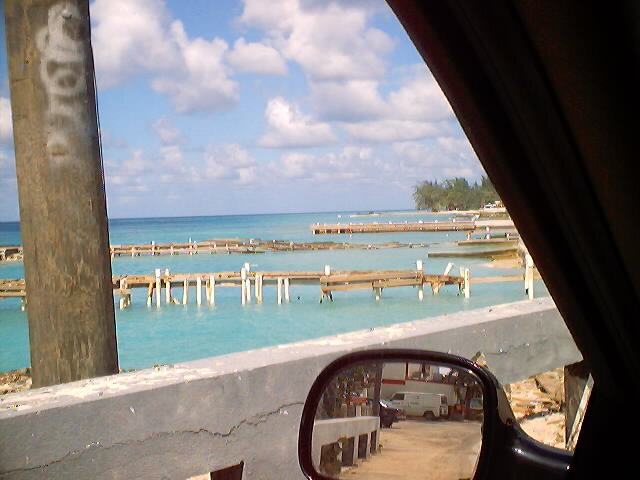 Cayman Airways is operating. If anyone from Northwest Point (Cobalt Coast) and other areas of West Bay is reading, please share your information with us...we're anxious to know. And Cayman Brac and Little Cayman...? Storm Photos from South Sound, Eden Rock in town, GeorgeTown Harbour. South Sound is taking a hard beating with Sunset House hit hard, and Eden Rock also hit hard. 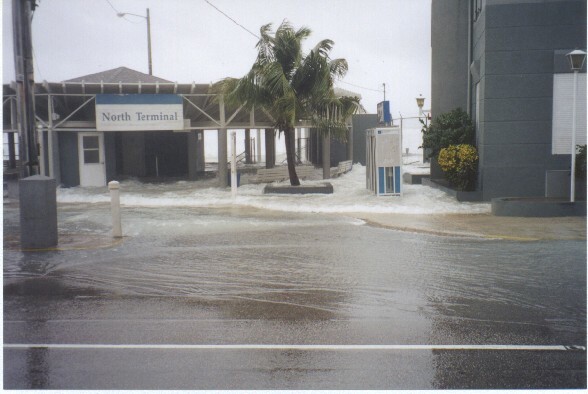 GeorgeTown is also being hit hard as well as Seven Mile Beach. The are reports of a Fuel leak at the Texaco large Tanks and you can smell its thickness in the air. All probabilities of some closures along that area tommorrow and very probable. 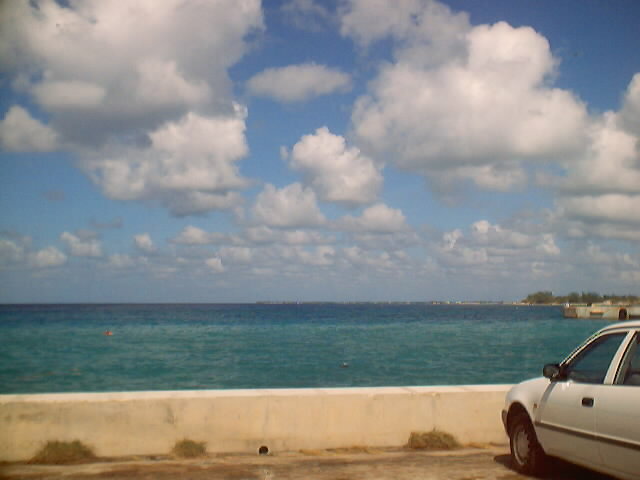 Weather is better now, no rains, still gusting winds howling at times and high seas. the SW moving slow to the West. for these areas of damage. still over cast, no rain in a while and the wind has died down a bit. About 45 minutes ago, we started getting wind and rain. spots between Rum Point and Kaibo. A few coconuts leaves fell down.. The rain is picking up. Being outside wouldn't be much fun. 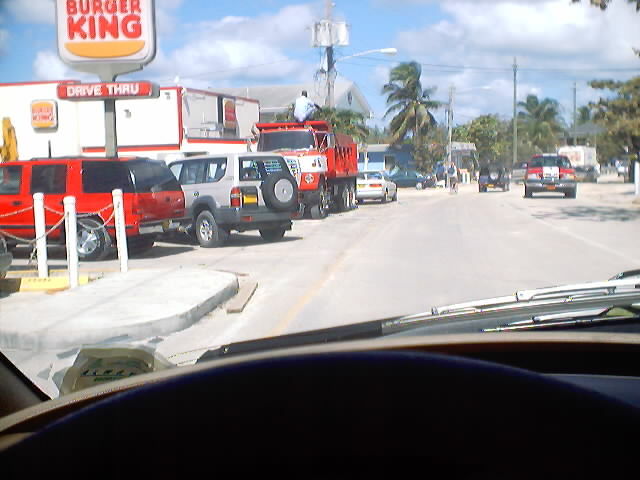 Well drove around from about 8:30 until now, took me 30 minutes easy to get home from Seven Mile Beach, perhaps longer. There are some whiteout simalar conditions driving around the airport, i was never more eager to get home than now, traffice is crawling on Crewe Road there is a tree down in the road just ahead of Ocean Club heading toward it, the police are using a machete to chop it up until reinforcements from i gather CUC arrive, it is not completely blocking the road but is across half. South Sound, i advise people to use EXTREME CAUTION South Sound is getting hit hard, alot of flooding, alot of depris in the road, my van got hit by a flying baby coconut and it sounded like a bullet when it hit my windshield, i drove as far up as Eden Rock, the flooding is really bad. 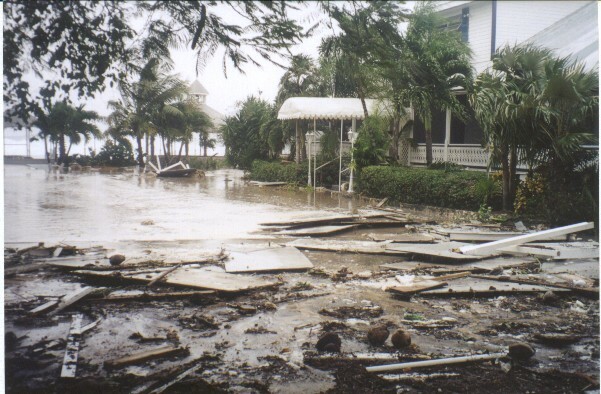 Eden Rock is under water, with large amounts of large rocks and other debris in the street. I witnessed a women who was sight seeing get comletely knocked over by a wave and that was standing in the street closed to the Maples and Calder Building.. I quickly moved my van to another parking area. If you are an adventures seeker.......TAKE CAUTION THERE IN SOUTH SOUND, the conditions are horrible and there are alot of things flying in mid air. 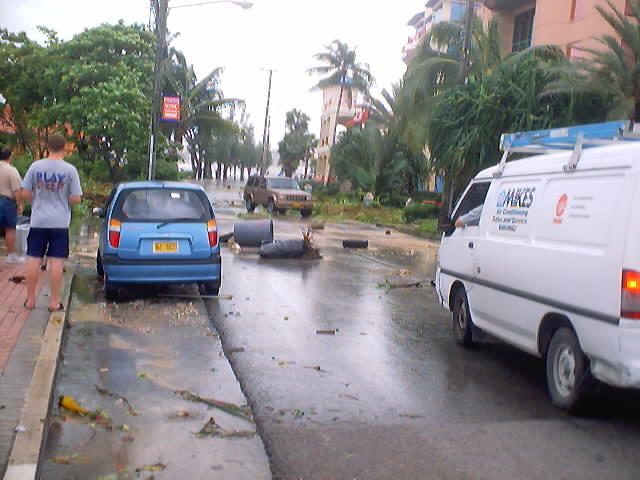 I drove to Holiday Inn, that is a sight, the sand from the beach side is completely over the street, alot of debris, wood, rocks, coconuts and a collection of plastic containers of all sorts, including garbage cans. EXERCISE CAUTION there too. Driving is horrible, with much of the traffice having to wait for one side or the other to pass before they can move along. i have taken some pictures and will be posting them to the site soon. Just need to transfer them to Jpegs. GeorgeTown is also under seige...CAUTION there, there are alot of sightseers there, be careful some people dont realize that about every 7th wave comes completely over the street up to the museum and people are getting knocked over, someone on a bike got alilttle to close and he ended up in the aftermath of the wave hitting the street, soaked, but not hurt. The rain squawls around the airport are causing great difficulty as far as visability goes, with some motorists stopping cuz ya just plain ole cant see. Its like FOG be careful. 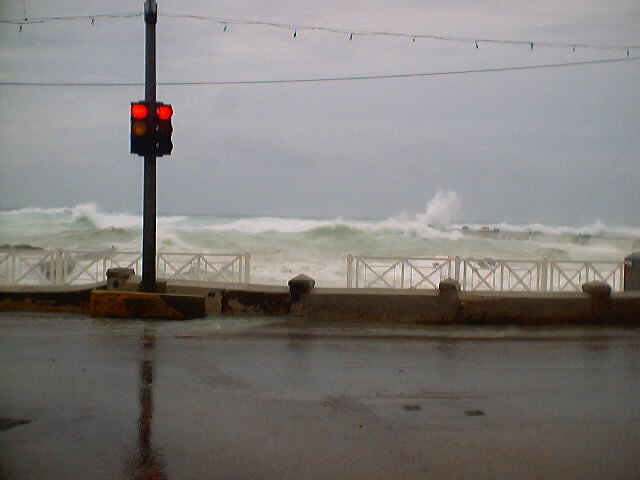 Its raining here at Ocean Club, with the sea still churring it up, its like someone put the blender on! more in the gusts. I just heard a plane leave so planes are flying out. that we forgot to bring in didn't even fall over. I don't know if we'll get the storm as it moves Northeast. Hope to hear from the correspondents on other parts of the island. Frank how's the weather on your side? Did I see you at Ocean Club on the Boardwalk at 7:50 am this am. It is now raining here at Ocean Club. Give us an update from your side Frank.Wonder how the Pirates Week Triathalon went if it was on? 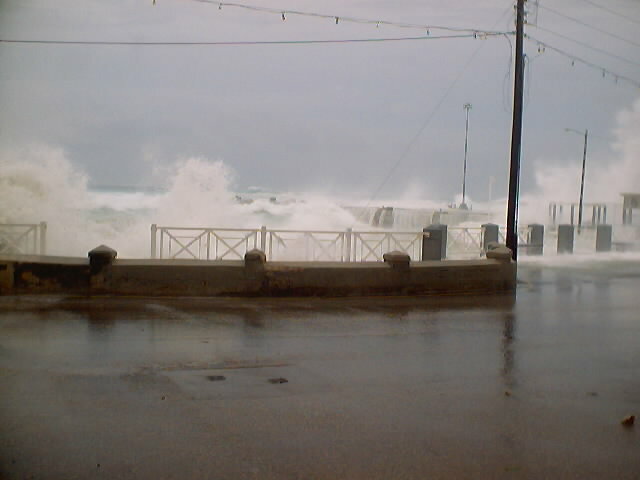 NOVEMBER 4, 2001  6 A.M.
WOKE TO HIGH WINDS AND HEAVY RAIN. THE WINDS ARE VERY VERY GUSTY AT TIMES. THE 13 WE ALREADY HAD FOR A TOTAL OF 16 INCHES INCH LAST MONDAY. I just wanted to mention to the many people who have emailed to ask me about flooding at Ocean Club. We have no flooding, thankfully, here at Ocean Club. The lack of rain during the night helped a great deal with that situation and at the moment our grounds are dry, a very unusal feeling for us because of all the rain we have had this past week & days. The waves however are a beautiful site, immense, the wind as i mentioned earlier is incredible! Good Morning. What a noisy evening we had.. The winds are just amazing to me, howling away as they still are this a.m. No rains...a new one for us, the waves are incredible.......they have changed direction thou and are not coming over the seawall, they are huge but crashing at a different direction. 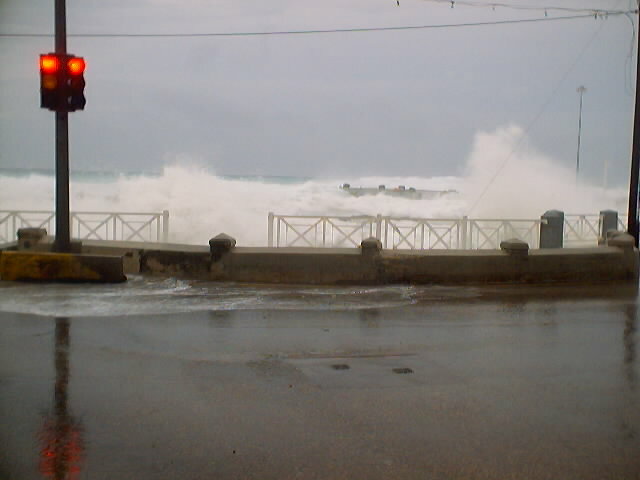 The harbour in Georgetown is closed the a.m. due to the excessively large waves which are crashing on the street and in some instances hitting cars while they are at it! Looks like my friend Donna down the road has been up all night too. This tropical storm-like weather is a very nasty surprise. I don't even want to think what's happening on the west side this morning. I'm definitely not going out on the roads to see. Hope everyone reading this is safe out there and checks in with reports from other GCM areas and the Sister Islands. there does not seems to be an eye. I hope this is good news! Until later. The Cayman NHC just upgraded us to a TS Warning which is a day late and a dollar short in my opinion. Not many people are up at 1am to hear about it. Just hope the wind doesn't swing to the W before day break because when it does, I am afraid there is going to be some serious flooding on 7 Mile Beach, and I'd hate to be sleeping on the ground floor at the Westin right now. The sea has damaged a number of properties so far here in West Bay, in particular Dolphin Point is getting hit. Not as bad as with Mitch yet, but it depends upon how hard the W wind gets. The satellite picture shows that Michelle is definitely changing, and I hope it is a weakening trend. Right now, it looks like she's trying to form a larger eyewall. I guess the next recon mission will tell. Based on the actual track over the last 6 hours, if maintained, she will pass about 100 mile N of Cayman. Hopefully she will weaken dramatically and spare the people of Cuba a direct hit by a major hurricane . early this evening we went to George Town Harbour - what an AWESOME site. the south it seems. I can just imagine it is very rough at Ocean Club. will see what the morning brings. Will report later or in the morning. West Bay Road near the Holiday Inn has started to flood over with seawater. At 10pm it was still passible, but it was considerably worse than when I went through it at 8pm. The wind has picked up a bit and is a steady 25-30 mph out of the SSE on the ocean in West Bay (NW Point Dock). Seawater is coming over the seawall and onto the lawn at Dolphin Point. Seawater has also come up to the foundation of my building at least once in the past hour. I have not had a look at the mysat 1k yet as I just got back, but from catching the Weather Channel at my neighbours apartment downstairs, I gather that Michelle has moved .3 to the E and .2 to the N and it looks like we are starting to go under that lovely ball of bright orange for the first time. I do not know whether the Cayman National Hurricane Committee has upgrade us to a TS Warning rather than a Watch, but based on what I saw a few minutes ago, the steady windspeed (without rain) seems to be increasing, presumably in response to Michelle tracking more to the E.
Michelle just wont quit! The winds and rains are due to intensify although they are already gusting from earlier today they are due to intensify here at Ocean Club within the hour. I think the boardwalk is going to continue getting its beating..........the waves are just nipping the seawall so i'm sure their will be waters over it during the night. Just a quick hello to say that no serious flooding has occured in West Bay so far from what I can see. The sea has come up into the yard and driveway at Clan Creek, and Bonnie's Arch has closed off their driveway, but I don't believe either have suffered any serious damage so far. The overwash near the Holiday in is not as bad as Mitch (so far) and I drove through it about an hour ago without any problem. In fact, at the moment I was driving past the worst area, there wasn't any water flowing in at all, but that was just timing, as I could see that fresh seawater had come over the sand ridge just a few minutes before. The latest position shows that Michelle has taken a course E of NE over the past few hours, and it remains to be seen if that is just a wobble or whether she has started the predicted turn. I am going out for a recon mission (and dinner) and will report back later tonight. P.S. The Pirates week Triathlon start time has been moved to 1pm. Well it is now 7:15 pm and we are still experiencing gale like winds.......the wind is really incredible still blowing strong. Donna has just left from visiting to check out our waves not to long ago..she and i took a stroll out to the boardwalk to check out the waves...they are still crashing away. We are still under showers on this side of the island i drove up to northward and well....would not want to be driving up that direction again. Flooding, and heavy rain in some areas hard to see while your driving and the flooding is bad. Well the flooding around the island is bad....tried to get on the bypass and unless your heading into town you have no choice but to go in town the Thomas Russell portion is totally flooded like a huge swimming pool at one of the condo complexes. Wondering how our friends over on the northwest point side are..
our minds after reading the reports. About 5 pm I ventured into GeorgeTown to see if the Harbour was rough. to let others in that area give a true report. boards ripped up and washed away. damage from gusts at this point. 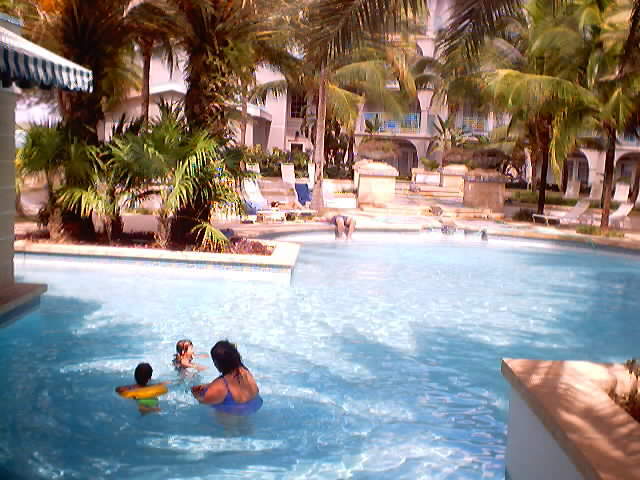 Hi Guys.....Ocean Club well...........thank God the worst is over. We have lost a couple boards from the boardwalk nothing like Chantel thou. The surge is incredible...water came up over the steps leading to the board walk during the night.. our email was out for several hours so couldnt report action as it was happening but the rain was coming down in sheets........and the winds were very intense, shaking those sliding doors for sure. The seas were sporting 7 to 9' waves. Took a couple walks out toward the boardwalk in the evening with flashlight in hand and the waves were just rolling.....the water came up over the boardwalk but not completely over the sea wall. we are still experiencing rains..............shut that faucet off already. 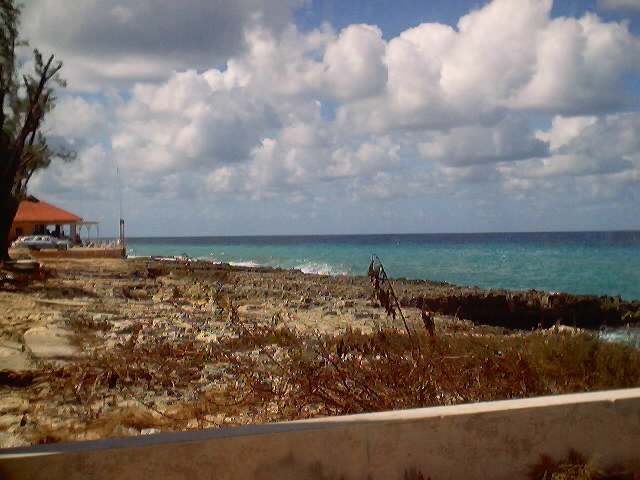 Hope Cuba weathers her well...............135 mph winds is not fun by any means. thanks for your great reporting Frank and others.........should things change will report it! Well, this is NOT funny! It's 11:30 a.m. and in the past 3 hours the road flooding has gotten substantially worse around George Town. By phone, I hear, residential areas around Randyke Gardens, Tropical Gardens and areas of South Sound are also badly flooded with concerns about water coming into apartments and homes.Rain has been relentless since 9 a.m. over here by the airport. I did stop by the MET office but no one is willing to comment on how much more rain we are likely to get. We've had another 1.5 inches since 8 a.m. here. And one look at any of the satellite pictures combined with the fact that Michelle is barely moving makes us out here very worried about conditions worsening during the next 24 hours. 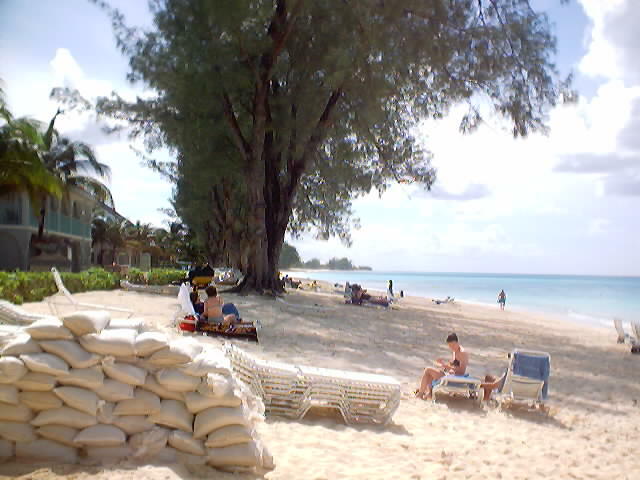 If there is a nice dry area of Grand Cayman, please advise and reserve me a room! Again, any Cayman residents should be aware of the amount of road flooding around George Town---and Crewe Road's potholes are getting worse and worse. Maybe those frantic calls from family in the US about reports of 10-20 inches here today are reliable!